VIENNA - FDG-PET/CT can identify a possible primary tumor in patients with carcinoma with unknown primary tumor (CUP) syndrome at a rate comparable to that found in autopsy studies, German researchers reported on Monday at ECR 2014. In addition to spotting a possible primary tumor in 59% of cases, FDG-PET/CT visualized 52% additional tumor manifestations compared with conventional diagnostics, according to presenter Dr. Ilinca Sacarea of the Practice in Cologne Triangle. The studies also influenced therapy procedures in 32% of cases. "FDG-PET/CT is and should be a valuable tool in the initial workup of patients with CUP syndrome," she said. One of the top 10 cancers in Europe, CUP syndrome is metastatic cancer without a known primary tumor and represents 3% to 5% of all cancers. Only 10% to 20% of primary tumors are found in clinical studies; 75% are found postmortem. The average life expectancy for a patient with CUP syndrome is 12 months, Sacarea said. The researchers sought to estimate the value of FDG-PET/CT for diagnosing primary tumors, for staging, and in therapy decisions in these patients. From a total PET/CT database of 2,800 patients from 2008 to 2013, the team retrospectively selected 156 FDG-PET/CT exams from 135 patients (68 men, 67 women) with CUP syndrome. All subjects underwent conventional diagnosis (CT, MRI, scintigraphy, and panendoscopy), but follow-up was available in only approximately 50% of cases, according to Sacarea. PET/CT scans were performed on a dedicated Gemini GXL16 PET/CT scanner (Philips Healthcare). Prescan patient preparation consisted of a sugar-free diet six hours prior to the scan; hydration with black coffee, tea, or water; and a blood glucose measurement of 70 to 170 mg/dL on the morning of the exam. About an hour after patients received an intravenous injection of 200 to 300 MBq of F-18 FDG, a whole-body scan was performed, including approximately 10 bed positions of two minutes with low-dose CT. Late scans were performed 2.5 hours after injection, with two to six bed positions at two to 10 minutes with diagnostic contrast-enhanced CT and a small field-of-view. If necessary, head reclination and a prone breast device were utilized. 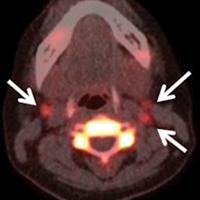 PET/CT identified a possible primary tumor in 92 (59%) of the 156 studies, including 31 head and neck tumors. The head and neck tumors were most commonly found in the nasopharynx (34.6%) and tonsils (23.1%), while the whole-body tumors were mostly in the lungs (38.8%) and the gastrointestinal tract (20.4%). Overall sensitivity was 93% and specificity was 87%. Sensitivity and specificity for tumors in the head and neck were 90% and 85%, respectively. 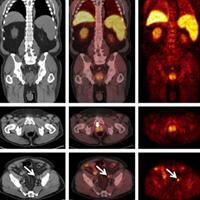 PET/CT also visualized 52% additional tumor manifestations compared to conventional diagnostics, Sacarea said. Based on the PET/CT imaging results, therapy strategy or course was changed in 50 (32%) of the156 patients. Supplemental research studies are now needed with higher patient follow-up rates, Sacarea said.